The SXSW Outdoor Stage at Lady Bird Lake features a three-day series of charity beneficiary concert events, which are free and open to the public with a SXSW Guest Pass. 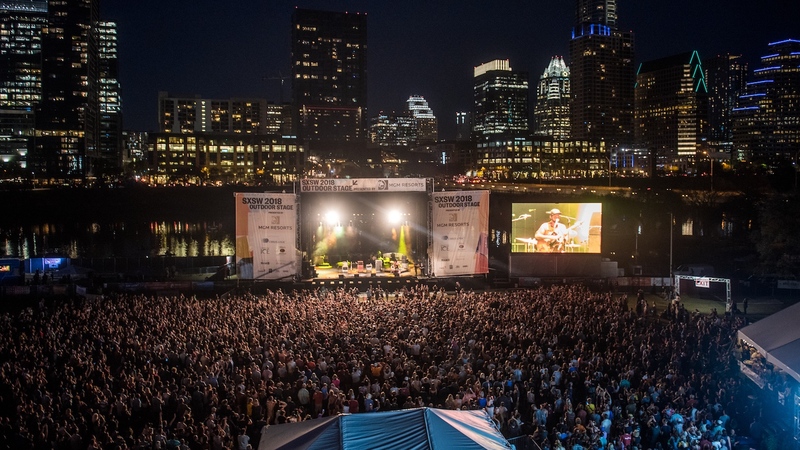 It is SXSW’s largest stage with more than 50,000 attendees over three days. The SXSW Outdoor Stage at Lady Bird Lake is our largest stage with more than 50,000 attendees over three days annually. The venue is located at 800 W Riverside Dr. Past performers at the Outdoor Stage include The Strokes, Nathaniel Rateliff & The Night Sweats, Patti Smith, The Flaming Lips, Childish Gambino, Bright Eyes, Garth Brooks, The Shins, Spoon, Explosions in the Sky, Ice Cube, Beach House, Norah Jones, Cheap Trick, Echo & The Bunnymen, Public Enemy, Ozomatli, Charles Bradley, Iggy Pop, Jim James, Erykah Badu, The Cult, Cold War Kids, Deftones, and more. The SXSW Outdoor Stage at Lady Bird Lake is free and open to the public with a SXSW Guest Pass. Visit guestpass.sxsw.com for more information. SXSW Badge and Wristband holders do not need a Guest Pass to attend. Doors will open at 4:00 PM each day. This page may be updated. Please check back regularly – contents are subject to change. The SXSW Outdoor Stage is a free and open to the public event. Download the SXSW GO mobile app and sign up for the SXSW Guest Pass to receive daily emails that identify access to new events, provide updates, and provide daily prize giveaway information. SXSW provides sign language interpreters for the concerts at the Outdoor Stage at Auditorium Shores. All concerts with the exception of William Tyler will be interpreted for our Deaf and Hard of Hearing guests. All attendees must consent to wanding and/or bag searches as a condition of entry (including re-entry). Entry will be expedited for patrons without bags or with clear bags. No bags larger than 18 x 13 x 8.5 inches (46 x 33 x 21 cm) will be allowed into the Outdoor Stage site. Leave valuables at home, or secured in your hotel. Are found to be in possession of any prohibited item and refuse to surrender such item to security for disposal. Fail to abide by the SXSW Code of Conduct. Engage in any behavior determined by a City of Austin Police Officer or SXSW Event Organizers to be illegal, immoral or disruptive. Appear to be to intoxicated. A valid, government-issued ID will be required to purchase and/or consume alcohol, or to access areas that are designated 21 and over. Smoking, vaping or using electronic cigarettes is prohibited throughout the Outdoor Stage event site (per City of Austin ordinance). SXSW may take photographs and/or audio/video recordings at the Outdoor Stage. By attending the Outdoor Stage event, you consent to SXSW’s use of your image, name, voice and/or likeness for any purpose, including in SXSW marketing materials, in any and all media now known or hereafter devised. Take the Roy Butler Hike and Bike Trail and the Pfluger Pedestrian Bridge to the main entrance at Riverside Drive and South 1st Street. Bicycle parking is available at the corner of Riverside Drive and South 1st Street. A dockless scooter parking area is available next to the bike parking at Riverside Drive and South 1st Street. Please do not leave dockless bikes or scooters outside of the designated area. Find out more and plan your trip at the CapMetro website. SXSW offers a free circulating festival shuttle from Downtown and point south. Let the friendly shuttle staff know that you are heading to Outdoor Stage. Some area public parking garages are available including the Palmer Garage and 505 Barton Springs. When possible, avoid driving. ADA parking is available at the Palmer Garage.